WASHINGTON (BRAIN) — Some hubs and sprockets would be among the $11.5 billion in goods subject to retaliatory tariffs of up to 100% proposed by the Trump administration. TAIPEI, Taiwan (BRAIN) — The Trump Administration’s ongoing dance with the Chinese over tariff issues — and with no end point in sight — has Taiwanese manufacturers and suppliers continuing to evaluate supply chain logistics. BOULDER, Colo. (BRAIN) — Has your company been negatively affected by the 25 percent tariff increase on e-bikes and e-bike motors imported from China? If so, PeopleForBikes and the Bicycle Product Suppliers Association invite you to submit comments to the U.S.
SAN MATEO, Calif. (BRAIN) — GoPro Inc. plans to move most of its U.S.-bound camera production out of China by next summer to mitigate the potential impact of new tariff lists. Production of cameras bound for non-U.S. markets will remain in China. BUENOS AIRES, Argentina (BRAIN) — President Donald Trump and Chinese President Xi Jinping agreed to a truce in the ongoing trade war this weekend. Trump agreed to delay implementing a 25 percent tariff on Chinese goods — including at least $1 billion in bike-related products — that had been set to take effect Jan. 1. HO CHI MINH CITY, Vietnam (BRAIN) — Before the start of any U.S. and EU discussions of tariffs on e-bikes out of China, Taiwan frame builder Astro Engineering Co. Ltd. started to increase its aluminum and carbon frame production capacity in Vietnam. 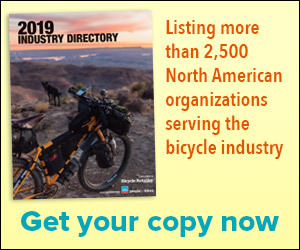 BOULDER, Colo. (BRAIN) — The Bicycle Product Suppliers Association and PeopleForBikes are collecting data from the industry as the groups prepare to apply for exemptions from the 25 percent tariffs on Chinese-made e-bikes and e-bike motors imposed in August. WASHINGTON (BRAIN) — Imports of all merchandise at the nation's major retail container ports have slowed from their pre-holiday peak but remain at unusually high levels as importers continue bringing in merchandise before tariffs increase in January, according to the monthly Global Port Tracker report released by the National Retail Federation and Hackett Associates.